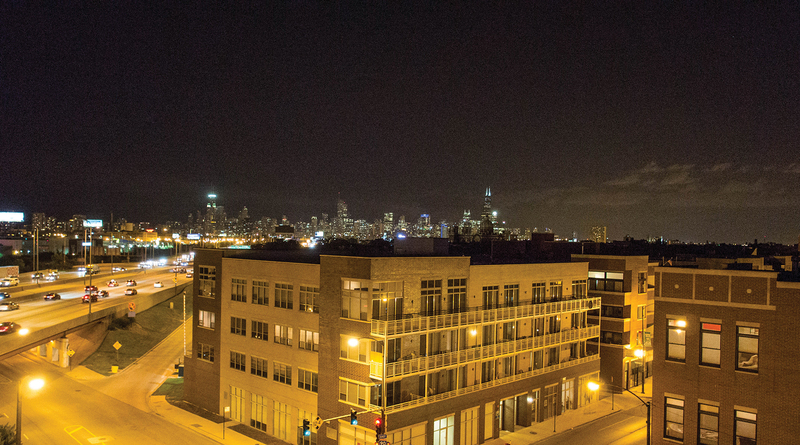 The Residences at 2006 W Webster set a new standard for luxury in Bucktown. Each residence includes 3200 square feet of living space with four bedrooms and four full bathrooms on a single floor, with 11’ ceilings throughout. The floor plate of the building has a width of 64’ and a depth of 78’, which allows for an expanded unique unit layout. The large open kitchens have Sub-Zero and Viking appliances, custom European style cabinets, and quartz countertops. 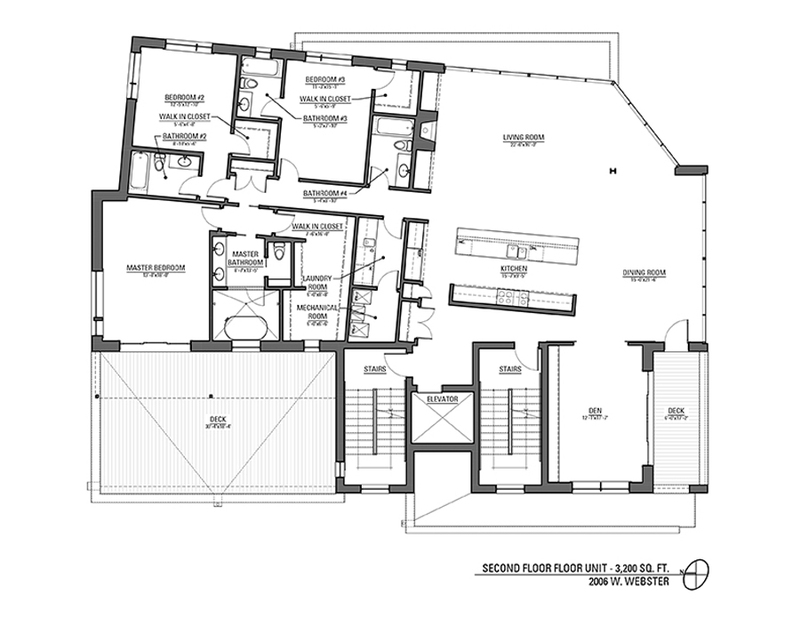 The expansive master bedroom layout includes a master bathroom with dual vanities. The “wet room” area will have a one piece free-standing porcelain tub with two shower areas; a Grohe Rain Shower/Body Spray system and standard shower. Next to the master bathroom is a custom built 16 x 10 walk in dressing room. 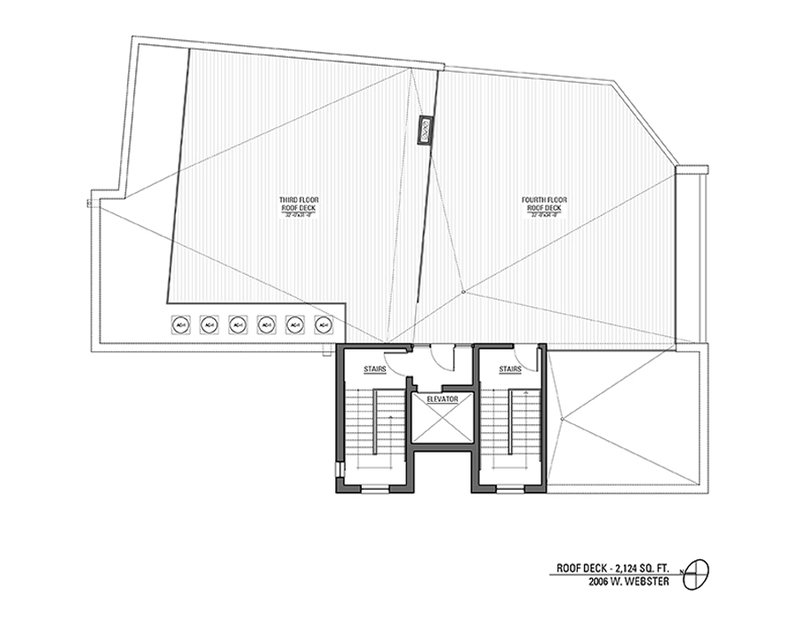 The units all have outdoor space off the master bedroom between the size of 186sqft – 600sqft. Bedrooms two and three each have walk in closets and a full bathroom either on suite, or directly next to the entrance door. 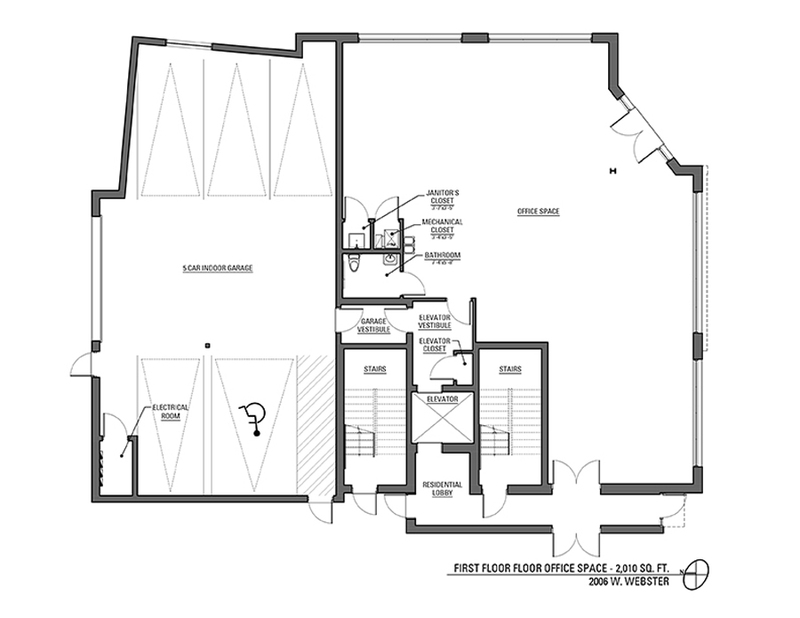 The 4th bedroom can double as a den or study – which walks out to the front terrace overlooking Webster Ave. 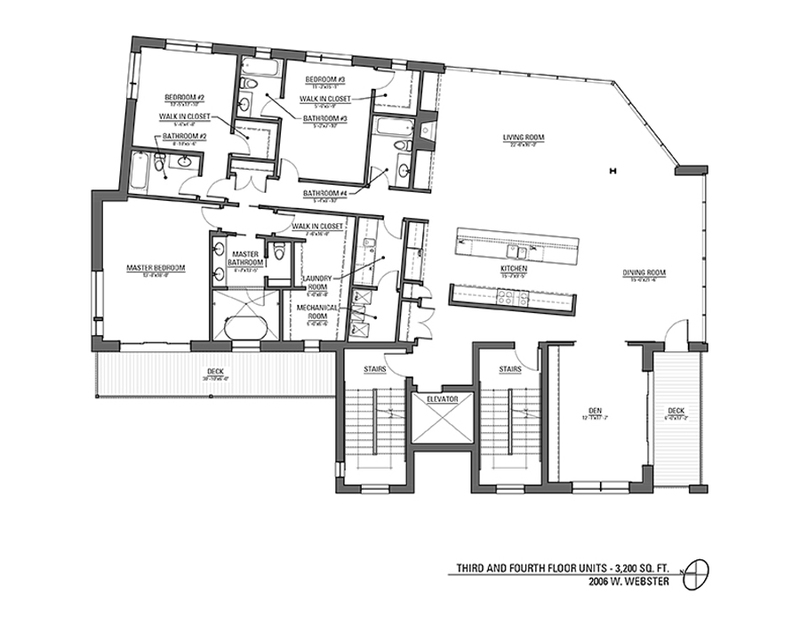 The main living space is comprised of an oversized dining room (21’ x 17’) and a large living room (21’ x 31’). The front living room wall will be centered with a wide view gas fireplace and surrounded by custom built shelves. 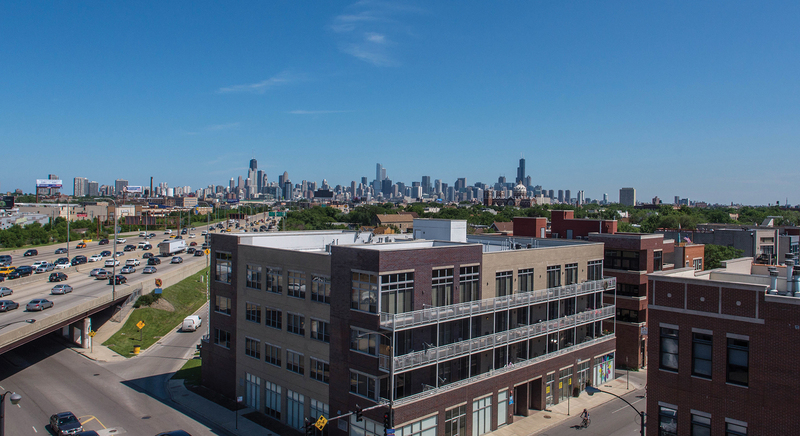 The exterior walls on the living room and dining rooms are floor to ceiling windows looking out over Damen Ave and Webster Ave.
Other amenities include a large laundry room with upper and lower cabinets with sink and a full size front loading washer/dryer. The property will be pre-wired for sound and CAT 6 ready. There is also a high efficiency zoned gas-forced air system. For more information, please contact Property Consultants at 773.489.4444.